German car manufacturer BMW has announced it is to pull out of Formula One and the end of the current season after a "landmark" decision to restructure the group’s motorsport activities was made by the company’s board in a meeting on Tuesday. A statement on the BMW Sauber F1 Team’s official Web site stated that “the Formula One campaign is [no longer] a key promoter for us” and that “current developments in motor sport” had resulted in the decision. The Chairman of the BMW board of management said: “Of course, this was a very difficult decision for us. 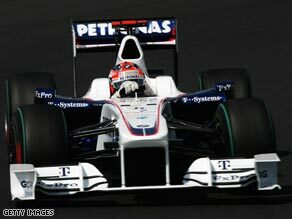 But it’s a resolute step in view of our company’s strategic realignment.” BMW entered Formula One with a takeover of the Sauber F1 team in 2005 and finished fifth in the constructors’ championship in their debut campaign, before racing under their own name in 2006. With an aggressive aim of winning the World Championship within three years, the team came close in 2007 finishing second to Ferrari, thanks largely to the exclusion of McLaren-Mercedes from the points standings.